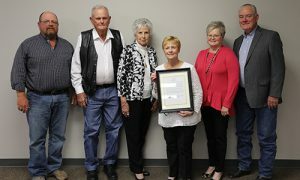 Larry Williams’ family pictured with resolution honoring his service to the industry. From left to right: Wes Williams, Herbert and Mary Kerby Williams, Virginia Williams and Nancy and Daylon Althoff. PCCA lost a loyal and dedicated supporter with the passing of Director Larry Williams in September. Williams was elected to represent grower-owners and their co-op gins in District 8 on PCCA’s Board in 2005. During his tenure on the board, he served as chairman of the Audit and Warehouse Committees and on the West Texas/ Oklahoma/Kansas Marketing Pool Committee. Williams also represented PCCA and its grower-owners at many meetings of state and national organizations. During his farming career, Williams served for 23 years on the Central Rolling Plains Co-op Gin Board of Directors and served on the boards of the 10th District Farm Credit Council and Roscoe State Bank. He also served his community as a Deacon at the First Baptist Church of Roscoe for 39 years and as a member of the Roscoe School Board for 15 years. PCCA extends its deepest sympathy to Williams’ wife, Virginia and other family members on his passing.